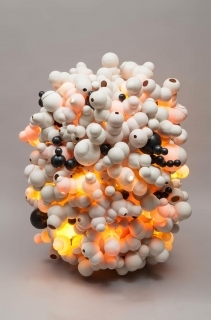 Katie Caron & Martha Russo Oxytocin (polymer), 2013 porcelain, metal, fiberglass, fluorescent lights 51 x 39 x 36 in. Bonding, cleaving, morphing, transmuting, and transmitting is central to our collaboration over the past three years. The works link molecular biological structures and systems to ideas about human relationships and external processes that surround us. The collaboration started with Apoptosis, a large-scale, site-specific installation created for the Denver Art Museum, Overthrown: Clay without Limits in 2011. A cacophony of thousands of lit porcelain and paper forms, clay co-mingled with a variety of metals, utility poles, insulators, and cables cascaded down a thirty foot-long slanted wall. The concept of the installation related to the process of Apoptosis, a type of programmed cell death and growth, and cross-pollinated with ideas about the power grid to create a dialogue between beauty and grotesquerie, order and chaos, gravity and levity and, in essence, speaking about the energies that are within us and surround us. The massive size and volume of the installation, looming overhead, drove the viewer to experience the piece from afar. The second collaboration, Oxytocin, at Ice Cube Gallery in Denver in 2012, sprang from a desire to enable the viewer to get closer to the works. In a 50 foot-long, 30 foot-wide space there were 3 free-standing forms and 2 wall pieces composed of many of the same sculptural components from Apoptosis. Electrical cords crisscrossed the space and illuminated 125 translucent, cell-like, porcelain pieces. Viewers were able to move in and out of the clusters of forms to experience the more human-scaled works. Oxytocin, known as the “hormone of love,” became a metaphor for concepts related to cellular permutations and the notion of personal bonds and attachments. The new work, Oxytocin (polymer)allows the viewer to relate to the work on an even more intimate scale. A singular, glowing gestalt made up about 850 porcelain and steel spheres invites the viewer to experience the work one on one. Pink and amber hues of light wash onto each colony of cells, giving way to a subtle, undulating palette of color and form. The tumult of Apoptosis and the tethering of Oxytocin have receded to an elegant lightness of being in Oxytocin (polymer). Similar to phototaxis, where an organism or a cell moves toward a source of light, Oxytocin (polymer) draws the viewer into quiet contemplation. In a sense, Oxytocin (polymer) is a distillation of many of the concepts, processes, and materials that we have been investigating since 2010.